Search tripadvisor.ca for Route 12, and you’ll find articles like Scenic Byway Route 12 in Utah. Today, we’re not looking at that stretch of highway. Instead, we’re providing a traveller’s perspective of GO Transit’s Route 12 between Niagara Falls and Burlington. Take note of the awesome “spaghetti & meatballs” map in the second article. If you’re looking for a timetable posted at Route 12 bus stops, give up — there are none. GO Transit removed them years ago and now expects us to carry electronic devices with a data plan. Alternatively, you can download the schedule as a PDF from the GO Transit website. If you must have a printed timetable, your bus driver might carry a supply (but don’t count on it), or pick up a copy if you’re at Union station. 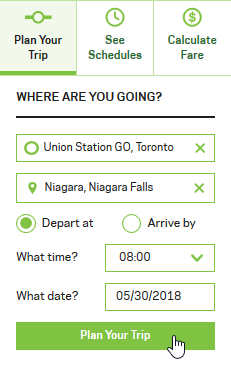 One anomaly that GO Transit continues to inflict upon the public is their use of “EASTBOUND / EN DIRECTION EST” and “WESTBOUND / EN DIRECTION OUEST” in the timetable. These are NOT compass directions! Metrolinx views Union Station as the centre of its universe, and trains on the Lakeshore West (LSW) line run eastbound into Union and westbound out of Union. Route 12 is viewed as an extension of the LSW line, so it follows that this bus route should inherit its directionality from the trains. I’m not buying into that logic. I’ve taken some liberties and updated the map that’s in the timetable PDF to illustrate the conundrum. The problem can be put to rest quite easily. Route 12 operates on the QEW, which has NO cardinal directions posted. Leaving Toronto, signage along the highway is QEW/Hamilton, QEW/Niagara, or QEW/Fort Erie; in the reverse direction, it’s QEW/Toronto. Given that they fall under the purview of the MTO, why doesn’t GO Transit follow suit? 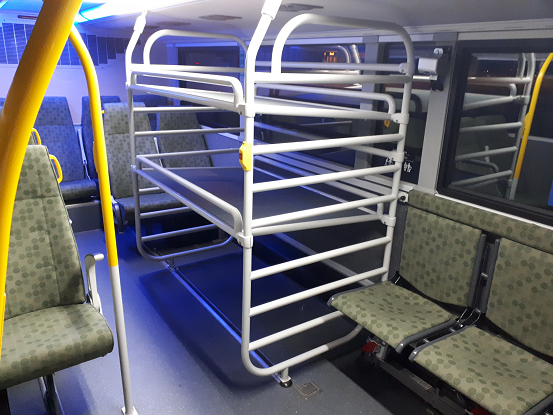 · 12A is the Grimsby to Burlington trip first thing on weekday mornings. It does not operate outbound from Burlington. · As of this writing, the 12D express trip between St. Catharines and Burlington (◄►) no longer operates. If you’re doing any more than a one off day trip, endear yourself to your bus drivers, and get a PRESTO card. If you must buy a paper ticket, do so at a GO station or the Niagara Falls bus terminal. For other stops along the route, you’ll need to buy your ticket from a driver — unless ticket vending machines have sprouted along the way recently. And remember, buses are not equipped to accept credit and debit cards; it’s cash only, and your $50 bills might not be accepted. Other trips will be suggested, but this is the one that gets you closest to the Falls in the shortest time. Unless you plan on taking the seasonal weekend train to Niagara region, you will require a train to bus transfer at Burlington as shown above. Tell the ticket agent this is what you want. Why is the onus on the passenger to get this right? Ticket agents, particularly those at Union Station, sell the seasonal train tickets even though that train to Niagara region is not operating. What’s the issue? There is a $3.00 premium per trip to ride the seasonal train. You’d think the ticket sales system couldn’t issue a fare for a trip that isn’t running. Call the toll-free number, 1-888-GET-ON-GO (438-6646), to get exact pricing for your trip. Do not rely on the website’s fare calculator. As of this writing, the fare calculator does not work properly. Once you are in possession of your ticket, don’t lose it. Keep it on your person as proof of payment, especially if you absolutely have to exit the bus at a stop to light a cigarette, take three drags, discard the still lit cigarette by flicking it in front of someone’s face, and then attempt to board the bus again. This incident actually happened. The self-entitled passenger wasted a significant amount of time arguing their case with the driver that they had left their ticket upstairs, and then had to retrieve it. 3. Which Bus Do I Board? After deciphering the timetable and knowing where you need to be and at what time, you’d think boarding the bus would be a snap. Wrongo! 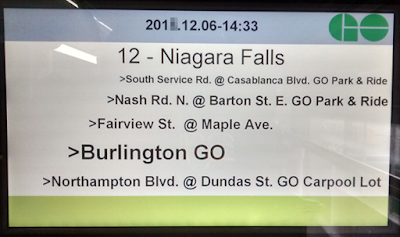 Frequently, Niagara bound buses and Burlington bound buses arrive at the same stop simultaneously or within minutes of one another. The St. Catharines stop is notoriously busy on a Friday afternoon, with a mix of local and GO buses pulling up to the platform. 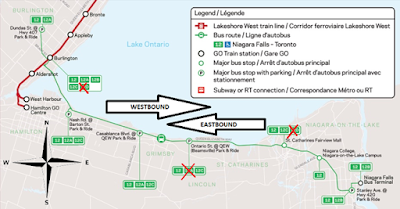 Don’t let St. Catharines Transit Route 12 buses (Vine St. northbound AND southbound) confuse you — ignore them! I recall being on a Niagara bound bus when a young lady waltzed on, tapped her PRESTO card, and took her seat in the upper saloon. We had no sooner pulled away from the stop and turned the corner by Home Depot, when she descended the stairs in a flurry, rushed up to the driver, proclaimed she was on the wrong bus, tapped off, and rushed back to the bus stop to board the Burlington bound bus. Drivers sensitive to perplexed passengers will announce via the external loudspeaker (if it’s working) the intended destination of the bus as it rolls up to the bus platform. Pay attention! So, how does the neophyte GO passenger identify their vehicle? Just read the lighted signage on the outside of the bus. It’s as easy as A, B, C.
A. This is the route number from the timetable. B. This is the final destination for the trip. C. This is a scrolling list of stops on the trip. GO Transit could improve this part of the signage to show only current and remaining stops on the trip, i.e. do not show stops already serviced. 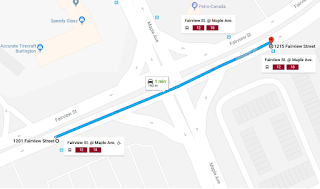 In this example, the bus is Burlington bound, making all stops, with the final destination being the Park and Ride stop at Dundas St. @ Hwy 407. There is also signage on the side of the bus to the left of the door, which displays information segments A and B only. The following image is from a bus making the same trip as the one above. In this case, the abbreviation CRPL (car pool) is used instead of P+R —more inconsistencies are addressed below. Sometimes a strip of “something” obscures the side signage and maintenance crews take an eternity to fix the problem. 4. How Do I Know When I’m at My Destination? This bears emphasis… Know where you’re GOing and stay vigilant to where you are en route! Even though buses are equipped with interior monitors that display upcoming stops, which automated announcements are designed to call out, the technology can let you down. How? The recorded announcement can be garbled. The interior and exterior speakers may have been wired in reverse, or the PA system is inoperable, in which case the driver may need to bellow out the stop. 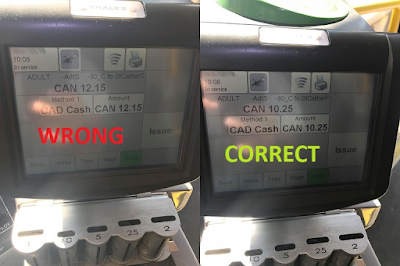 Experienced drivers will make their own announcement for the approaching stop, because they know what the bus technology tells you is NOT NECESSARILY what’s printed on your ticket. Note that the aforementioned stops on the south side of Fairview St. are not listed as designated stops after the bus leaves the carpool lot on its way to Burlington station. 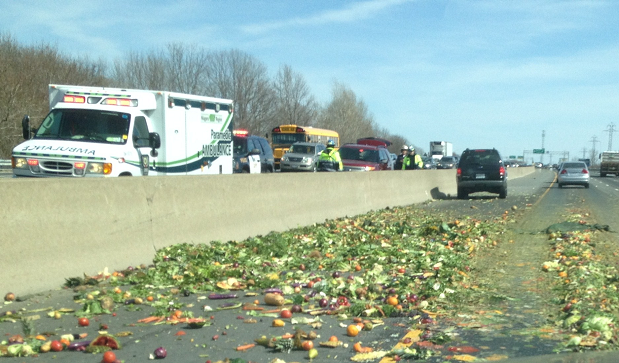 Buses have been known to drive past intending Niagara bound passengers who have tried to flag down said buses. Hmmm… that sounds vaguely familiar. 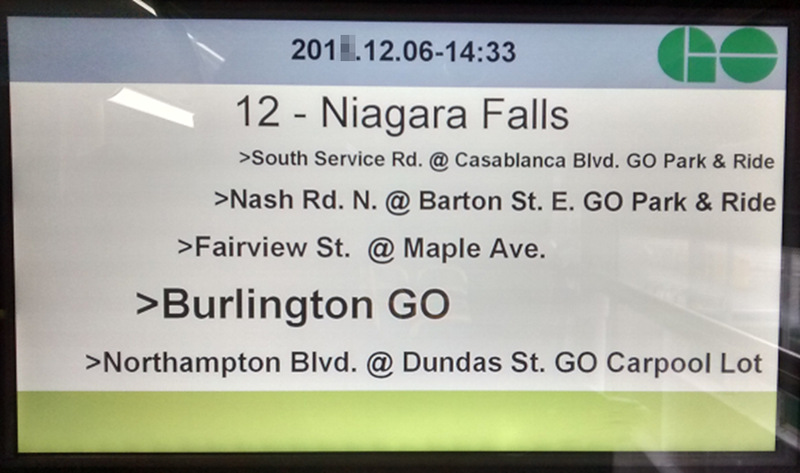 · The timetable specifies Dundas St. @ Hwy. 407, whereas (i) the interior monitor refers to the stop as Northampton Blvd. @ Dundas St. GO Carpool Lot, (ii) the front exterior signage specifies BURLINGTON P+R, and (iii) the exterior side signage says BURLINGTON CRPL. · The timetable specifies Casablanca Blvd. 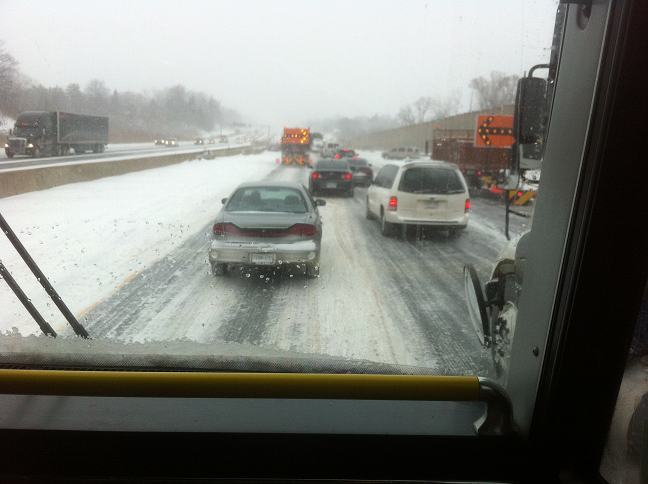 @ QEW, whereas (i) the interior monitor refers to the stop as South Service Rd. @ Casablanca Blvd. GO Park & Ride, and (ii) the front exterior signage specifies GRIMSBY P+R. · The timetable specifies Stanley Ave. @ Hwy. 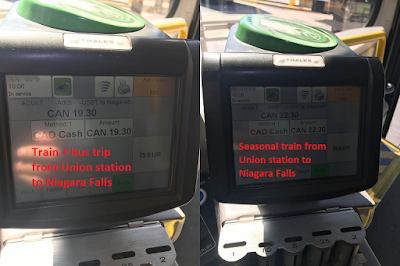 420, whereas (i) the interior monitor refers to the stop as Stamford St. @ Stanley Ave. GO Park & Ride, and (ii) the front exterior signage specifies NIAGARA FALLS. 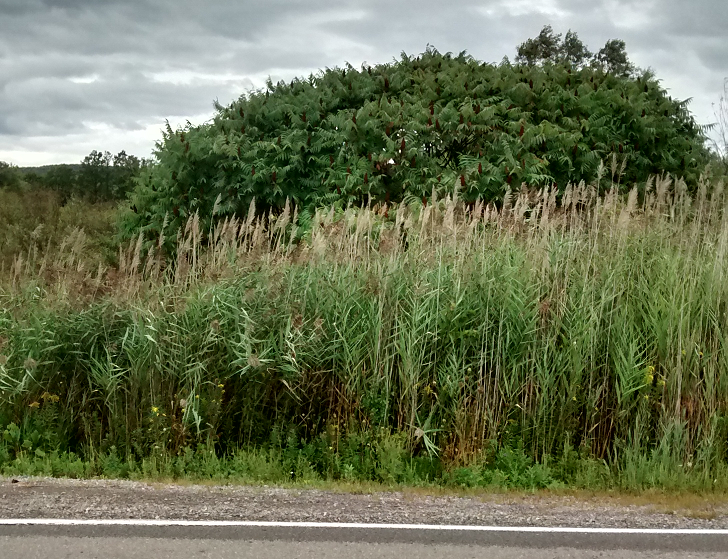 · Zone 82 is Beamsville per the timetable, Lincoln per By-Law #2A, and generally defined as Ontario St. @ QEW. How many QEW exit signs list Ontario Street? Three — in Grimsby, Beamsville, and St. Catharines. When heading to the bus terminal in Niagara Falls, there is no good reason to stop at the 7-Eleven on Victoria St. for a jumbo Slurpee; the same goes for your Tim Hortons large double-double. Why? 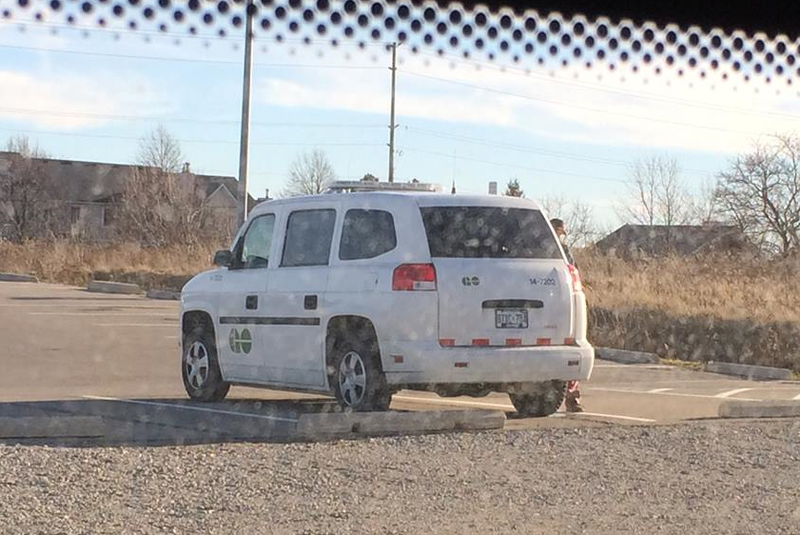 Because GO buses are not equipped with a washroom. This point cannot be stressed enough — take care of your business before you board. So, after leaving Niagara Falls some 2+ hours before, this is what you have to look forward to for relief. Consider it, too, from a driver’s perspective. This is their layover spot before the trip back to The Falls — day after day. Who would want have a sit during those -20°C days of winter? Is this the type of loo the brass at Metrolinx use? If it’s not good enough for them, why would passengers and front line staff think it’s acceptable? ● 18:30 As a result of a collision on the Skyway Bridge, buses on your route are delayed up to 40 minutes. ● 19:15 As a result of a collision on the Skyway Bridge, buses on your route are experiencing delays of up to 75 minutes. 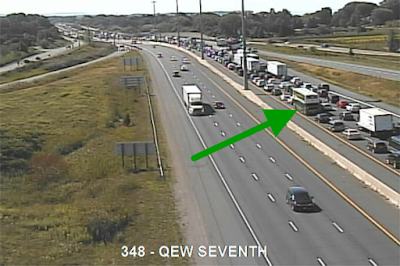 ● 22:54 We are experiencing delays between 45-60 minutes as a result of multiple collisions at QEW between Centennial Parkway and Fruitland. Buses are detouring via South Service Road until further notice. Then there’s the proverbial double-decker breakdown due to coolant leaks, diesel fuel leaks, engines dying, and diesel fumes inside the bus. In these events, please identify yourself to the driver if you have first aid or medical training. Everyone else, please stay seated and keep quite. The driver has to manage the situation as best they can and doesn’t need to waste time getting around passengers who are milling about in the aisle, especially if it’s in the upstairs saloon of a double-decker bus. Again, it’s important to remember the advice in section 6 above, because a delay can happen at any time. 8. Are you just going leave that mess? Drivers like to present their passengers with a clean bus. Every now and then, passengers forget the advice in section 6 above resulting in some serious “Name that Stain” scenarios requiring a change-off of the bus for sanitary reasons. At the end of each trip, drivers perform a quick inspection of the inside of their vehicle looking for refuse and sleeping passengers. In a pinch, I’ve done it for them. Here’s a bit of advice. If you drop your French fries all over the floor, pick them up and deposit them in the waste bags on board. If you change your infant’s diaper on the rear seat, don’t leave the soiled diaper behind when you exit. And, dude, if you are going to drink your beer in the rear of the upstairs saloon of a DD and then repurpose your empty tallboy as a private latrine, man up and take the can with you! 9. DANGER, Will Robinson! DANGER! The scheduled buses on Route 12 are the ADL Enviro500 SuperLo double-decker models, numbered 83xx–84xx currently. Passengers who head to the upper saloon for the journey must take extra precautions when leaving the bus. The descent down the stairs is very steep — steeper than the older model DD’s in the fleet — IMO. A word of caution… If you’ve packed your suitcase so densely that it’s like a heavy bag of cement, you’ll have problems getting your luggage in and out of there. This cargo bay design, like that of Megabus, can be very dangerous. 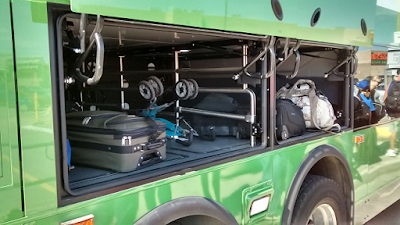 I talked to a Megabus driver who told me one of his colleagues went to unload a soft-sided duffle bag thinking it was relatively light weight. It wasn’t; the bag had rolled coins in it. When the driver tried to catch the falling bag, he ruptured two discs. That driver’s career ended that day. Always execute a “tug test” before unloading luggage! 10. Why is that GO bus blocking the right turn lane? This question is asked frequently by motorists who are stuck behind a Route 12 bus that is taking on passengers on the NW corner of Hwy 420 @ Stanley Ave. Google Maps satellite view caught DD #8148 at the location. It’s not clear whether #8148 is still moving; buses I’ve been on have rolled forward so as to be even with the bus shelter. Some motorists become impatient, go around the bus, and cut in front of it whilst passengers are boarding. Doesn’t this vehicular maneuver contravene the Highway Traffic Act section 140(3)? 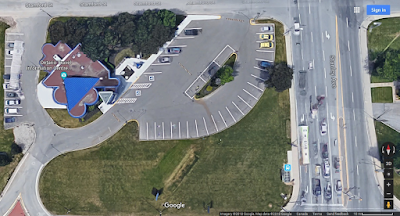 There is a solution, and that is to have passengers board the buses at the Ontario Travel Information Centre. The facility is already owned by Government of Ontario. Years ago an employee at the information centre told me talks about this strategy had taken place with Metrolinx, but nothing came of the matter. Maybe Metrolinx used the word “soon”, and the employee didn’t take the term in the proper context. Perhaps our new premier, Doug Ford, can resolve some of the issues described herein. He already lit a fire under someone at Metrolinx to get GO Transit’s real-time bus information service rolled out — at least I assume it was Doug. Do you have your own perspectives (passenger or otherwise) travelling Route 12? Please add them to the comments. Wow, I think I'll stick to my car. Anyone who could figure this out on the first try should be eligible for an honorary doctoral degree. It is amazing how daunting transit can be to not only tourists, but also locals! 1) I have long pondered the utility of the “Fairview @ Maple” stops. 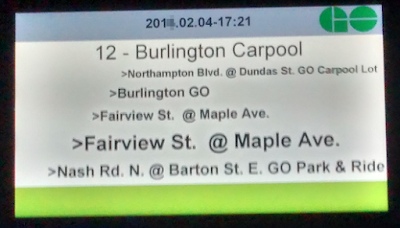 I noticed a few times where they were necessary to time a transfer to Burlington Transit #101, but I was nervous to try that…and didn’t really need to anyway. Interestingly enough, I used the “2nd southbound stop” just last week. Or more precisely, the “improvised, halfway between Maple and Brant, stop” that seemed reasonable to that run’s driver as I made my way to the Second Cup (thanks again to that driver – probably saved me 5 minutes). 2) You are more optimistic about the “12 -> 47 -> 40” route to Pearson Airport. I have done it before, but I rarely find times where it’s faster than the “12 -> LSW -> UPX”. I would think about this very differently if the #40 stopped at the Burlington P+R/CRPL. 3) Good point about the B’ton-bound stop on Stanley @ 420. I’m less concerned about the effects on right-turning motorists, but I suspect that Travel Information Centre would provide a more comfortable stop for riders. That's reason enough. 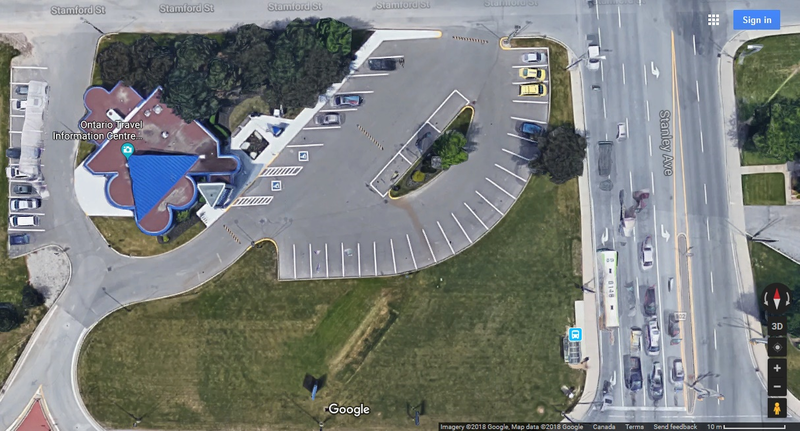 Of the current stop designs, my biggest beef is with Stoney Creek: I find the time and annoyance of the ‘tour du bloc’ through the industrial area to be extraordinary. It seems to me that the bus used to use the plaza parking lot at times where it was likely to be empty, but I haven’t seen that happen in a while. Last thing: please do direct message me if you know of any potential channels to make this notorious route better for riders. - Every town/city in Niagara (but for Welland) have separate Megabus/GO/NRT terminals and good luck transferring between them. If GO ever made it to Welland, I'm sure they'd pick a spot by the canal just so they didn't have to leave the highway. - When Megabus/Coach Canada abandoned the Highway 8 run, GO should have immediately offered replacement service, even on a limited scale. Beamsville is 48 minute hike from "Beamsville" GO station. What about people who need the hospital in St. Catharines, Grimsby or Hamilton? Chuck you, Farley. Get a lift. 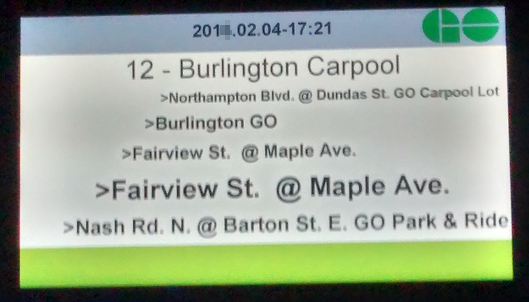 Of course, demand, or lack of it, is a huge factor in deciding where things go and how convenient routes should be, but if you make Burlington-Falls an express run every hour, you can offer concurrent local services so that least "the locals" get the ability to move within and outside of their areas without radically inconveniencing cheapos from Toronto who don't qualify for the casino bus. Just an FYI, The 7-Eleven on Victoria is no longer there and hasn't been for some time. 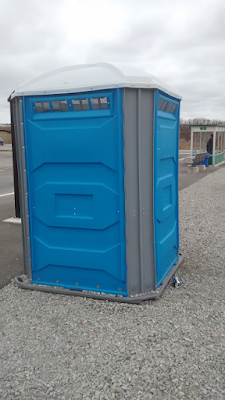 That being said use the washroom before you board because the GO buses have no facilities on board. Let's change "jumbo Slurpee from the 7-Eleven" to a "large wonton soup from Country Fresh Donuts" (across the street). I do hope they are still in business. Ian, they are indeed still in business. An update… The bus stop on the southeast corner of Fairview St. and Maple Ave. was decommissioned on Sept. 24.